a couple of weeks ago, i attended my first ever kc blogger meetup event. it involved saks off fifth, free $25 gift certificates, food, sangria & local kansas city bloggers. everything about it sounded fantastic, and then i got there and this insane yellow maxi skirt practically jumped off the rack and into my arms slapping me silly with markdown after markdown and i finally agreed to bring her home with me. it was love at first twirl around the fitting room. it was my first blogger event and actually the first time i've been to a saks off fifth - i thought it was a great opportunity to meet other area bloggers and shop, of course. the next event is this sunday at Madewell (!!!) followed by a private fall sneak peek event at J.Crew (double !!!) later this month. and just like that, blogging has become a lot more interesting... and expensive. 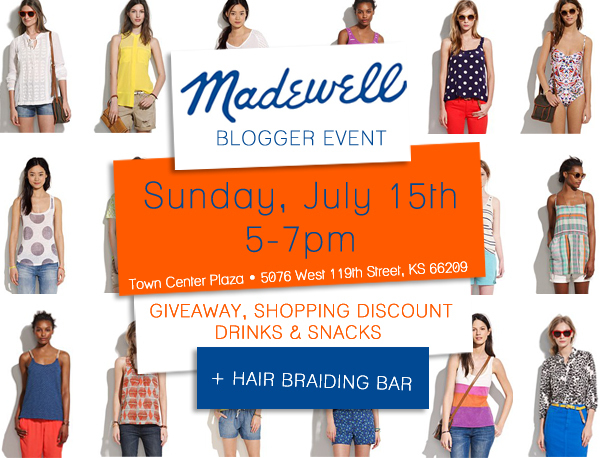 you don't have to be a blogger to take part in the Madewell event - it is open to the public. if you're in the area, join us on sunday at Madewell - and if you see me twirling around the fitting room, come say hi! That skirt is adorable! I picked up a similar one at Loft earlier this summer and I love it. I am going to Madewell too so hopefully we can meet there! Yay, I love how that skirt looks on you, especially with the fun necklace. I don't think I'll make it to the Madewell event, but I'll definitely see you at the J. Crew one, I can't wait! thanks shea - and thanks for the group picture too! :) see you at j.crew! The skirt looks amazing on you! So jealous you snagged the last one.